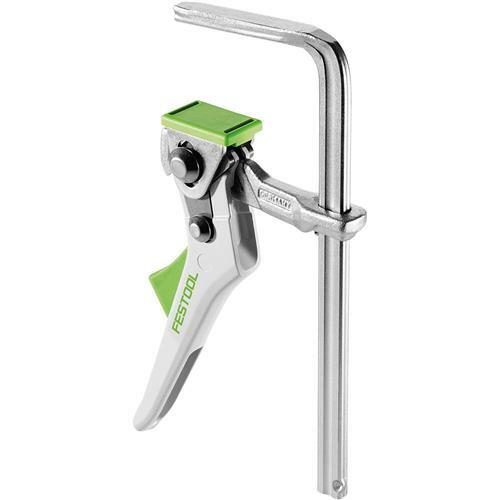 Festool 491594 - Quick Ratcheting Clamp, 6-5/8"
The perfect complement to the Festool MFT or Guide rail system, the Festool Quick Clamp secures your workpiece for precision cutting, sanding, routing, sanding, or just about any other application. Ratcheting mechanism enables easy locking and quick release for a secure grip on your material. Designed to work seamlessly with holes and channels on the the Festool MFT Multifunction Table and can be inserted into bottom t-slot of Festool FS Guide Rails for limitless positioning. Clamping thickness 6 5/8 inches (168mm). Secures your workpiece for precision cutting, sanding, routing, sanding, or just about any other application. Works seamlessly with holes and channels of the the MFT table and can be inserted into bottom t-slot of guide rails for limitless positioning.